What did we Learn from Constitution? How to screw it up in Classic Fail Squad Games style while playing AD&D! Previously we took a look at Strength, Intelligence, Wisdom, Dexterity, and today we dig into Constitution to see how the Fail Squad Gamers might have used, abused or glazed over the rules in the books. On the surface Constitution is that thing that gives our characters more Hit Points, but it also encompasses a general heartiness and an ability to carry on – Drinking, running, swinging a sword and even hold down your lunch when greeted by an Otyugh. …a term which encompasses the character’s physique, fitness, health, and resistance. Constitution tells a little story behind the rules that follow the initial description of the attribute in the book. The paragraph just prior to the CON table explains that a character may not be raised more times than their initial constitution score. I.E. 15 con = can be raised/resurrected 15 times. The 16th time, you are dead forever. It never occurred to me that this was telling me something as a player and as a DM. Gary was intending for players to die, he also intended for players to carry their friends to the cleric and be resurrected. I may have made resurrection a much rarer event in my games than intended. Your constitution score also LOWERS by one each time you are raised from the dead. You lose that one point (and all its’ benefits) forever. So what’s to screw up? One of the first things we glazed over was a very OBVIOUS piece. The Minimum requirements of Constitution. Here is where I know we glazed over things. 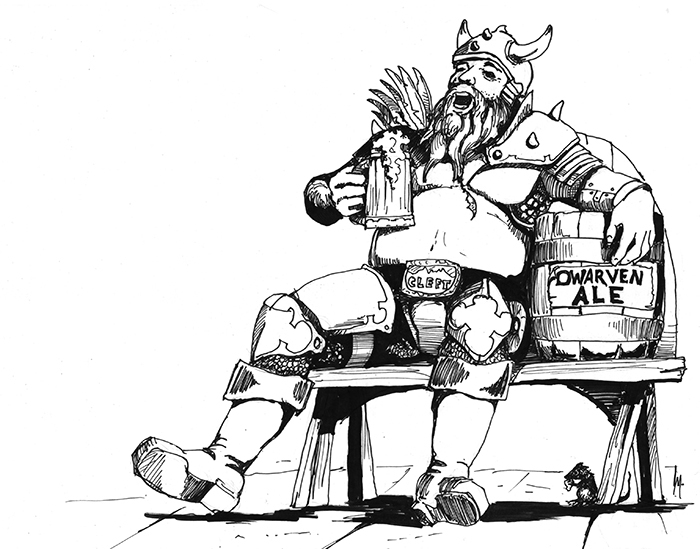 We always thought of Halflings as bit lazy sometimes, pipeweed smokers, heavy eaters. I KNOW we had plenty hobbits with less con than this. We stumbled here quite a bot as well. Even though we know dwarves are hearty folk, the 12 con minimum slipped under our radar for years. I think its’ important to note that these minimums are for PLAYER characters. It doesn’t mean the entire populace of dwarves, even the very elderly have a 12 or better constitution. Many of our mistakes around Constitution and other stats falls into the arena of racial requirements. We carefully read the requirements for our classes, but skimmed the surface of race. Somehow we gleaned the bonuses (Elves +1 with long swords and bows) from the text but jumped ship on the other details. This would be one of the many deciding factors in 1E that makes Humans the most common player character race. I don’t think we out-right misused or misinterpreted this much, but as a DM I am sure I missed some opportunities to use it. I have to question if a potion of speed (Or other item that causes aging requires the save), but I know I have had players polymorph in adventures through folly and traps without requiring the roll. An encounter with a cockatrice comes to mind where I didn’t require the system shock roll at all when players were getting turned to stone. Sometimes it’s the small things in the rules that we over-look that may shift the game balance significantly if they are ignore or over-looked. Sometimes some additional fun can be had by putting them back in place where they belong. How have you misinterpreted or missed the rules?